British physicist Ernest Rutherford was the son of a man who fixed wheels on horse-drawn carriages, and he became the most prominent experimental physicist of his era. He was at the forefront of early studies of radioactivity, humanity's increasing understanding of the atom, and the dawn of nuclear physics. He coined the terms alpha ray, beta ray, gamma ray, and half-life for radioactive decay, and he was widely credited in his time as the first scientist to split the atom. He studied under J. J. Thomson, and in 1896 he designed what was then the world's most sensitive electromagnetic wave detector, capable of identifying waves at a distance of several hundred meters. In the same year he showed that x-rays cause air molecules to split into equal numbers of positively and negatively charged particles (ions). In 1899 he noted two distinct radiations, which he termed alpha rays and beta rays (high speed electrons), and in the same year discovered the radioactive gas radon. In 1902 he showed that radioactivity is a manifestation of sub-atomic change. In 1903 he collaborated with Frederick Soddy on the disintegration theory of radioactivity, showing that certain heavy atoms spontaneously decay into lighter atoms, and coining the term "half-life" for radioactive decay. 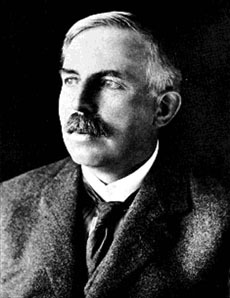 In 1905 Rutherford proposed a measure of the relative rate of decay of uranium atoms that would allow minerals to be accurately dated, a radioactive dating system that, when applied, greatly reduced the scientific estimate of the age of the Earth, and formed the basis of dating technology still used in geology. In 1906 he proposed that the atom's structure is nuclear. In 1907 his research showed that the alpha particle is a helium atom without its electrons. He won the Nobel Prize in Chemistry in 1908, and in the same year, working with his student Hans Geiger, he developed the Rutherford-Geiger detector, capable of detecting single particles emitted by radioactive atoms. In 1911 he described in detail the nuclear model of the atom. In 1913, working with Henry Gwyn Jeffreys Moseley, he used cathode ray bombardment to show that the inner structures of atoms can be used to assign an atomic number to each element. In 1914 he described the proton, and in 1917 he effectively created the field of nuclear physics by beginning a series of experiments showing that the nuclei of some light elements could be disintegrated by radioactivity, and that fast protons were emitted during this process. In 1917 he became the first scientist to split the atom (though not by entirely artificial means), changing nitrogen into oxygen. In 1932 two of his students, John Cockcroft and Ernest T. S. Walton, used an accelerator to split the nucleus of the atom in a fully-controlled manner. In 1934 Rutherford and another of his students, Mark Oliphant, discovered tritium. The list of scientists who studied under Rutherford is a veritable Who's Who of 20th Century science — Niels Bohr, James Chadwick, Otto Hahn, Edward Victor Appleton, Patrick M. S. Blackett, Edward Bullard, Pyotr Kapitsa, Cecil Powell, and numerous others. At his laboratories, Rutherford was known for singing "Onward Christian Soldiers", performances which grew more spirited when the lab's findings grew more promising. As a college student in New Zealand, he stayed at a boarding house operated by widowed suffragette Mary Newton, and married her daughter. Years later Rutherford spoke out for gender-neutral admissions at Cambridge, and in the last years of his life he served as President of the Academic Assistance Council, a group that sought to assist Jewish scientists escaping Nazi Germany. The only child from his marriage, a daughter named Eileen, married the physicist Ralph Fowler (1889-1944).